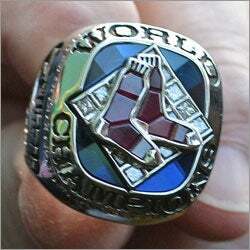 Here’s your first look at the rings the Red Sox will receive today during today’s Opening Day ceremonies at Fenway, which begin at 1 p.m. (Photo by George Rizer, Globe Staff). Speaking of secrets, the Sox aren’t revealing who will throw out the first pitch. Any ideas? Our Boston Sports Blog rounds up a few theories. Click the “Comments” link above to post your best guess.